It's December; it's the end! I'm free from searching high and low for these Japanese learning resources. I can go back to having a life now that the year is over. Oh wait, you're still here? Ahem. Welcome to the last month of our series on Japanese learning resources. We've compiled a list of the best new stuff to help you learn Japanese. But you know the drill by now, this is the twelfth one. December had some fantastic shows and websites, so let's get to it. Finally, a site that can do my job for me. Japanese Source aims to become a one-stop shop for Japanese resources; a place where you can find the right study tool from their user-generated database. Japanese Source aims to become a one-stop shop for Japanese resources. Each entry lists the title, URL, a short description, and some tags. You can vote on resources you use and, thanks to a recently added feature, you can review resources and give them a score you feel it deserves. If you're the creator of one of these resources, you can contact Japanese Source to get editing rights for your entry. While this site is very much in its infancy, with your help, it could become a fantastic resource of resources. Just think about how long it took you to search through Google and Reddit to find the core textbooks, apps, and websites you use today. Don't make other people go through that. 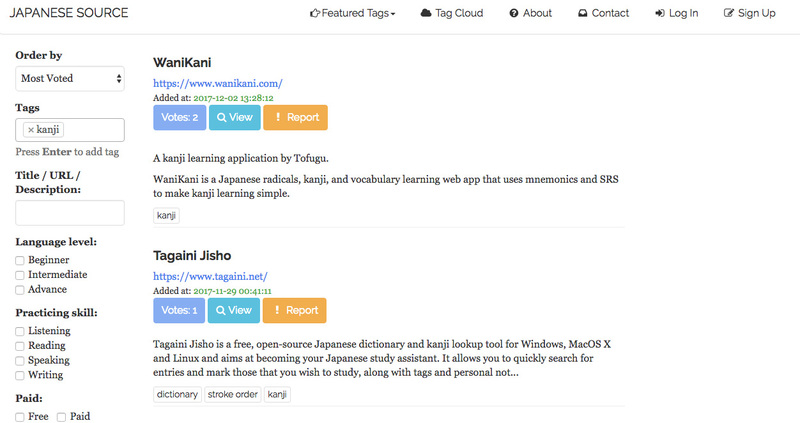 Go add all of your favorite Japanese learning tools right now! While this game isn't actually "new," it is new to the Nintendo Switch. Hiragana Pixel Party is a pixel art rhythm game that helps you practice hiragana and katakana. While it shouldn't take you long to learn, sometimes knowing is different from "knowing well enough to use it." There are multiple worlds, missions, and types of gameplay to make sure you not only recognize kana, but that you know it inside and out. You don't want your little character to die because it didn't jump or hit the right kana character, right? The game also gets pretty difficult, pretty fast. You'll really have to know your stuff to keep up. But if you manage to master the game and complete all the levels, you'll know your kana is top-notch. For those who haven't gotten their hands on a Switch yet, it's been available on Steam for a while. But you'll have to pay more for the Deluxe edition, if you want everything that's available on the Switch version. This is the first of three Netflix "originals" (Japanese titles licensed by Netflix) that came out this month, so there's something for everyone. 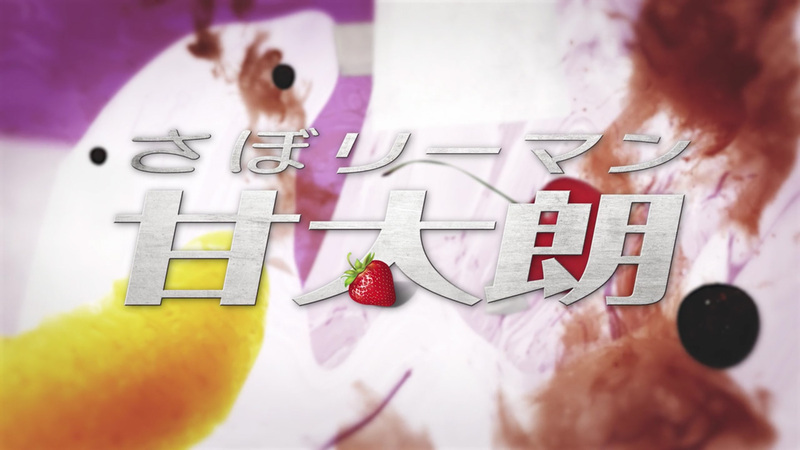 The first show, Kantaro: The Sweet Tooth Salaryman, is a spiritual successor to shows like Samurai Gourmet and Sunshine Sento Sake. Compared to its predecessors, it's way weirder and way "sweeter," but it's helpful in the same ways. You can learn about work and food language and culture, but because of all the inner-monologuing there's a ton of history added about locations as well. And while the main character is far more fetish-y about sweets than characters from the other two shows are about food and baths, the formula is the same. You can learn about how different sweets are made, how to order at certain types of restaurants, and hear some very exaggerated accents. You'll also learn a lot about traditional Japanese sweets, where they come from, and how they're made. The explanations can be quite quick in these sections, so I'd recommend this to intermediate students more than beginners. But there are Japanese subtitles if you aren't confident, no matter your level. This way you can see how to spell all of the new food words you're learning. One warning: the main character tends to get… too happy about his food. Some scenes are probably not what you would expect from a show about desserts. You may not want to watch this around your parents if you're embarrassed by that kind of thing. Because I don't want to spoil the show, above is the trailer for the first season of Good Morning Call, the live action adaptation of a manga from the late 90s. It has everything a high school manga from that time should have: a cute, clumsy teen protagonist, a standoffish but handsome love interest, and tons of ridiculous romance. I hadn't watched the first season until the second came out this month and I got completely hooked. Another feature makes this show extra study-friendly: an audio track option called "Japanese – Audio Description." It adds a neutral male voice explaining, in Japanese, the events of each scene. Story quality aside, this show is great for a few language-related reasons. The main character speaks slowly (unless she's excited) and everyone speaks in the standard Tokyo dialect. Topics usually stay focused on school, renting apartments, part-time jobs, sickness, and dating. These are all important when it comes to learning a language and because the story doesn't stray too far from these themes, you'll hear the same words enough to learn them without needing too much outside practice. There are English and Japanese subtitles, as usual, but another feature makes this show extra study-friendly: an audio track option called "Japanese – Audio Description." It adds a neutral male voice explaining, in Japanese, the events of each scene. While it might seem jarring at first, this is a fantastic way to deepen your study while watching Good Morning Call. You can hear everything in Japanese. Literally everything. The only issue with this is the Audio Description is not included in the subtitles, so you can't double check if you heard the voice correctly. But it's meant to be an explanation, so it's usually clear and easy to understand even without help. This option exists for many other Japanese shows on Netflix, so keep an eye out! I mentioned it for this show specifically because I think it's simple enough that adding them will help your studies. If you aren't the type for sweet obsessions or fluffy romance, Erased might be more your style. It's the live action adaptation of a manga known as 僕だけがいない街 in Japanese. Erased is more like an anime compared to what we usually recommend, but there are some interesting things you can gain from it. As with most dramas, the main character and most others speaks slowly, which makes it easier to follow. Because there are flashbacks, you get to hear childhood slang and Hokkaido dialect. If you live in Hokkaido (or want to someday), you can use this show to learn a thing or two, with the help of a guide we wrote. The content, however, is kinda creepy. And you won't get as much vocabulary out of it as you would with a slice of life drama either. But if you need a gripping thriller with time travel to get you interested in using shows to learn Japanese, then this is a solid choice. Erased covers some dark themes though, so it won't be for everyone. This site isn't technically from December; it came out a couple months before. But we just learned about an interesting recent feature that we had to talk about. Manga Club is a site that posts officially licensed manga free with ads. But we're not telling you about it because free manga is great; they recently added the ability to easily switch between Japanese and English with the press of a button! 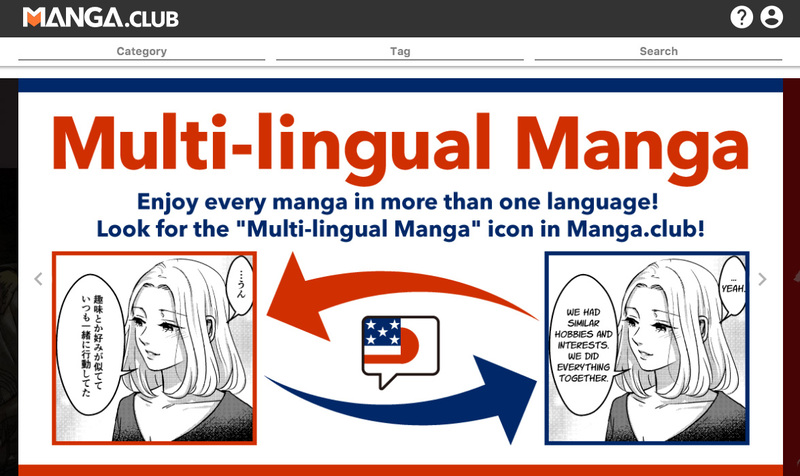 Now you can read free manga without needing to choose whether to buy Japanese, English, or both, if you want to use them to study. Now, if you aren't sure what a sentence means in English, you can switch back to see how it was translated. And for a site that's only existed for about two months, there's already tons of manga to choose from. A quick warning though: there's a lot of adult content on this site and some of the ads reflect this. Adults only for the ones that say so, okay? I'll trust you. This little java application adds dictionary definitions to video subtitle files, with the interface in the video itself. For Japanese text online we have extensions like Rikai that let us look up words as we read, but there hasn't been anything for videos until now. At least not one that can be used on any device. Jijimaku is a video overlay that shows Japanese definitions on screen, just long enough for you to pause the video, check the meaning, and continue. It isn't meant to be a subtitle program, but rather a quick reference so that you don't have to stop what you're doing and look up a new word. One of its biggest draws is that it claims to work for "any O.S., on smartphone, on TV, etc…"
You also have the option to either ignore words by frequency or ignore a list of words that you enter yourself. 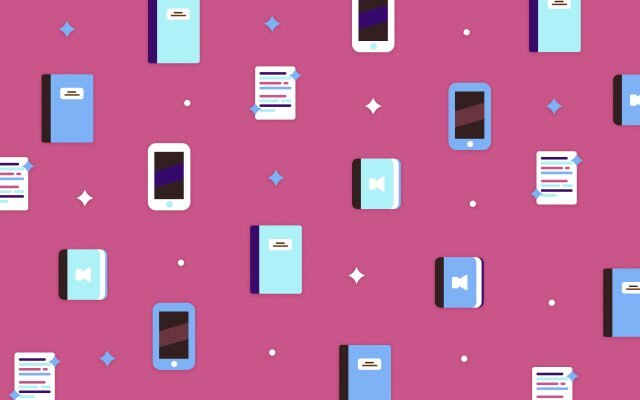 If you watch a lot of video content to study, this could be a huge time saver for your current routine.